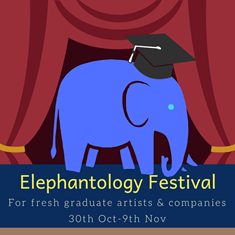 LONDON – Playing as part of the Blue Elephant Theatre’s Elephantology Festival for new companies and graduates, Ugly Bucket theatre is presenting their new play Bost-Uni Plues! Everyone says that university is the best three years of your life. The only problem is – what’s the comedown going to be like once you graduate? Based on the true experiences and stories told by graduates, join three clowns as they leave the comfort of timetables, deadlines, and student life behind and enter the real world. A world full of expectation, proper jobs, and council tax. Bost-Uni Plues is an explosion of energy, honesty, dance, movement, techno, and plain silliness that explores life after graduation. Because when you’re told that the best three years of your life are behind you, what else is left other than post-uni blues? Winning best production at the Liverpool Fringe 2018, the play has been described by audiences as ‘electric’, ‘brave’, ‘heartbreaking yet f***ing hilarious’ and ‘the cheapest therapy I ever got!’ Come on down to the Blue Elephant Theatre this November and get ready to blast those blues away!